A 127 film camera taking 12 4cmx4cm pictures made by Kinsho Seisakusho. Distributed by Ueda Shashinki-ten. 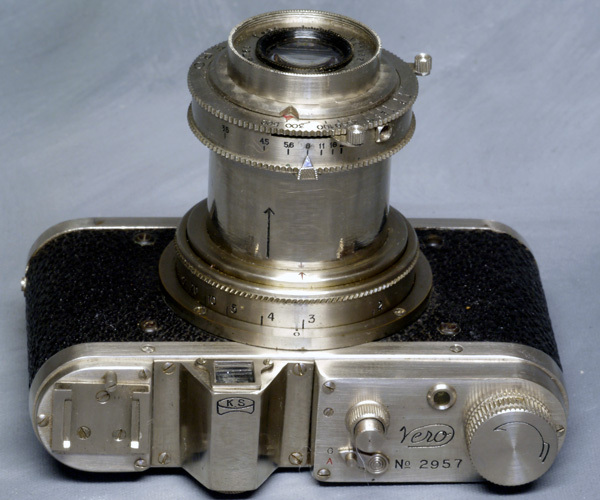 All metal viewfinder camera finished in nickel with a focusing helix at the base of the telescopic tube and a Verona Anastigmat 6.0cm f/3.5 lens. Rapid-Vero T, B, 1-500 shutter. Has an auto-stop advance mechanism with automatic exposure counter (small round window on top). Film loaded through the bottom.